To recap, for anyone who missed (or has understandably forgotten) my first two posts, I’m a PhD student working on eighteenth-century Gothic and travel writing. In a nutshell, I consider travel literature as part of a broader popular print culture that the Gothic novel comes to participate in. I’m interested in seeing how ideas about the Gothic are established or employed there before being drawn upon and adapted in fiction. Back in December I expressed a hope that I’d be back soon to discuss an image published in a relatively obscure eighteenth-century travelogue. I’m not sure if April counts as ‘soon’, but I hope that what follows will at least bear up the ‘interesting’ part. 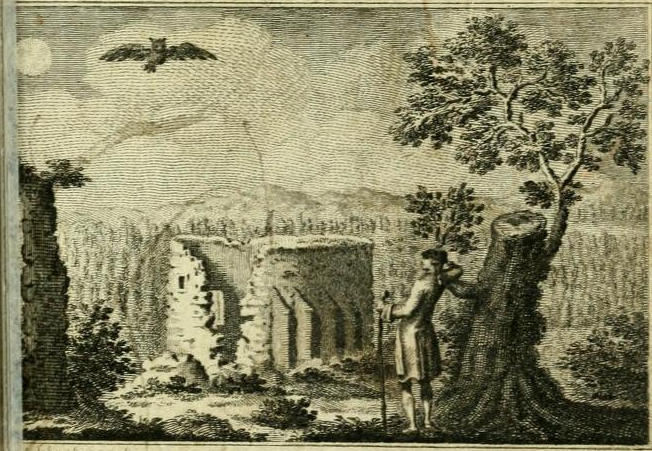 The above image was printed on the title-page of the anonymously published A Journey to the Highlands of Scotland, with Occasional Remarks on Dr Johnson’s Tour, by a Lady in 1771. Along with the other information there it helps to establish the text’s subject-matter and audience. Here, it seems, is a book of domestic tourism with a scenic focus. It’s a slim volume, by ‘A Lady’,  and might therefore be expected to offer some diverting aesthetic and sentimental description without straying into weightier issues of politics or natural history. These expectations would only be half-correct, incidentally, but that’s a topic for another day and a longer analysis. For this blog, I’m staying on the title-page, hoping to persuade you that for now, it’s OK to just look at the pictures. It seems fair to say then, that the Lady’s text isn’t just an example of the recent vogue for Scottish travel-writing; it is also a text about the recent vogue for Scottish travel-writing and its apparent claim to confidently examine and evaluate a challenging region like Scotland. With this context established, the text’s frontispiece becomes more interesting and its peculiarities start to appear significant. We might note, for example, that the illustration doesn’t just offer a representative landscape as a ‘taste’ of the material to be described and evaluated within the text. Instead it presents an image of that process itself, depicting a figure in the act of contemplating and comprehending the landscape. But the situation of this – apparently male – traveller is quite ambiguous. Instead of exercising an expert gaze that forms a prospect from outside its pictorial representation, he seems almost to have overstepped his frame and been brought to a halt within the scene itself. What’s more, as indicated by the full moon and the owl, it is clearly night. So is the traveller’s posture – leaning back slightly, hand to his eyes – one of critical command as he contemplates the prospect? Or is it in fact suggestive of bafflement: caught in the glare of the moon as it emerges from the clouds and surprised by the sight (and presumably sound) of the owl as it swoops over his head? Other details in the construction of the scene incline me towards the latter interpretation. For one thing, the ruin that should form its centrepiece is too close, dominating the foreground rather than being carefully framed in the middle-distance. The result is that the traveller isn’t so much aesthetically assessing it within a prospect view as he is brought up against it in a kind of confrontation, stopped at the edge of a ridge with no obvious onward route. There are models for some of these materials in popular eighteenth-century print-culture, but they don’t necessarily stem from a confident and evaluative literature of travel. Instead the obvious precedent is set by Gray’s Elegy with its “moping owl” who “does to the moon complain” as another landscape slips out of sight and description. Gray’s poem has its place in relation to a broader tradition of ‘Graveyard Poetry’, as a space for the development of a Gothic aesthetic and imagination and it is this Gothic property that appears to be particularly emphasised in the illustration that introduces the Lady’s text. Here the encounter with landscape seems to become an encounter with its Gothic potential – with the ruin standing partially lit in the moonlight, its interior left in suggestive obscurity. There’s a lot to be said about the text as a whole, about the way it manages expectations associated with gender (quite cleverly, if you ask me) and about its place within a broader body of travel-writing tackling Scotland in and around the 1770s . For the purposes of this blog though, I’ll have to apologise for stopping at the title-page. Innocuous as it first appears I’m intrigued by the way that frontispiece doesn’t just reflect the text’s critique of ‘expert’ masculine travel but conveys this by drawing upon the Gothic. I think that’s interesting. Ann Radcliffe was big reader of contemporary travel-writing and I’m willing to bet a chapter of my PhD that she’d read some Scottish travelogues before setting her first novel in Scotland. Before its Gothic narrative kicks off, The Castles of Athlin and Dunbayne begins with a journey by a male character who oversteps himself in his wanderings, becoming lost and anxious in a mountain landscape that won’t fit itself to easy picturesque description. I think that’s interesting too. The Lady’s Journey has merited discussion in some important studies. In addition to Hagglund, see: Zoe Kinsley, Women Writing the Home Tour, 1682-1812 (Ashgate, 2008), and the Introduction to Barbara Britton Wenner’s excellent critical edition of the text (Valancourt Books, 2010).